Nearbuy Refer and Earn gives you free shopping worth Rs 100. When the referral offer was started. Nearbuy was giving Rs 300 worth credits to referral and referee. Through which one can buy awesome deals which were Domino’s Voucher worth Rs 500 or Pen drives and memory cards for free. But the 300 Nearbuy referral program only lasts for a day. Now they had reinvented the Nearbuy refer and earn and are giving Rs 100 worth shopping for free. To make your first purchase free you need to register on Nearbuy and then find the product and apply referral code on the product at the checkout page. One user can avail this loot only once per Nearbuy account. As we are saying this program is one of the refer and earn program. So, Yes you can also earn referral credits through this program. Once you make your first purchase. Go for Refer and Earn section on the tab (the option would be seen on the same tab as in your account section). Copy your Nearbuy referral code and refer your friends and family. They will get chance to shop for free and you will get Rs.100 worth credits for each referral. That’s has limit of 1500 credits each account. You must also not spam the refer and earn program. Do check the terms and conditions for the same and take benefits of the referral program. You can also check our Nearbuy Coupons section to get more savings and get the exclusive Paytm deal on Nearbuy. If you like this program do check jonomus refer and earn section. We had included all refer and earn programs like Payumoney Refer and Earn, Amazon Refer and Earn and more. Here is the step-wise procedure of claiming your first deal/shopping free at Nearbuy. Offer valid for Nearbuy First Purchase. To avail offer minimum transaction of Rs. 600 required. Refer your friends to nearbuy and earn Rs. 100 per referral upto maximum of Rs. 5000 worth nearbuy credits. 2. Register for a new Account using email, mobile no. etc. 3. Search for the right product and add product in your cart. 4. Select your address and proceed to checkout. 6. You will get 35% cashback on Rs. 600 minimum purchase. 7. Complete the paymenet (if any) and place your order. 3. 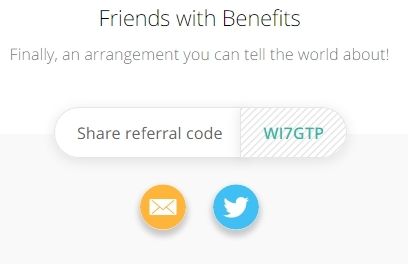 You will now get your referral code. 4. Share this referral code to earn credits Rs 100 per refer. 1. Program is valid till 31 December 2016. 2. Referral credits would be valid till 31 March 2017. 3. You will receive credits once your friend avails the deal purchased in their first transaction within the validity period of the Voucher. For Product deal – Its the delivery, for Local deal – its the redemption at the merchant site and for Travel deals it meant to the Check in the hotel or holiday. 4. The maximum limit for referral bonus is limited to 5000 credits per nearbuy account. 5. If referral cancels his/her order you may not get the referral bonus. 6. Any suspicious activity can lead to deactivate your account. You can Share this deal via these buttons down below. Keep visiting jonomus for better savings and loot deals on the web. 11 Responses to "Nearbuy Refer and Earn – 35% Cashback | Rs. 100 Referral"
Nearbuy per products show nahi kar raha jese watch, thermawear, t-shirt, etc , only hotel, pizza,spa etc show kar raha hai ? Hey we can do unlimted times in one phone….? By buying the deal below 100…..